Crosspointe - Welcome to Crosspointe! Unlike cookie-cutter developments (including many newer communities), we have almost 1,400 homes in a variety of styles, set amid an abundance of trees and green space. Within Crosspointe proper, our residents enjoy two swimming pools, six tot lots, eight tennis courts, five multipurpose courts, two large and scenic ponds (you can even fish in them) and a spacious community center, all extremely well maintained. 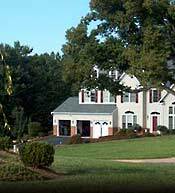 In addition to miles of community and county-maintained trails that run right through the community, our residents are within just a few miles of the beauty and recreational offerings of Burke Lake Park, Fountainhead Regional Park, a public golf course and, soon, a world-class golf club. Two elementary schools operate within Crosspointe’s boundaries, and a new secondary school is nearby. The cultural and entertainment offerings of Washington, the quaint waterfront charm of Occoquan and the beauty of the Virginia countryside are all just a short drive away. If you’re already a Crosspointe resident or are returning to our website, welcome back. Chances are you’ll find something new since your last visit. We continually post news updates and information about upcoming events and community happenings. Our on-line discussion groups allow you to share information and to chat with your fellow residents on many topics of interest. We also make it easy for you to communicate with your trustees about the issues that matter to you. This site is dedicated to serving and promoting the interests of our residents; and we’re always looking for ways to make it better. If you live in Crosspointe, you already know what a great community it is. We hope this site will make your experience as a resident even better. If you’re visiting our site because you’re looking for a place to live and to raise a family, we encourage you to come visit Crosspointe in person. If you do, we feel confident you’ll choose to make it your home too. We look forward to welcoming you.